Introducing the new Taylor Grand Pacific! Powered by Taylor’s award-winning V-Class™ bracing, the Grand Pacific is a new round-shoulder dreadnought that introduces a whole new sonic personality to the dreadnought category and the Taylor line. It’s a Taylor like you’ve never heard before. Compared to the “modern” acoustic sound Taylor has become known for—vibrant and articulate, with clearly defined notes—the Grand Pacific’s voice features broad, overlapping notes that blend smoothly together to create a warm, seasoned sound. If you’re already a fan of Taylor, the Grand Pacific reveals a uniquely inspiring flavor to explore. If the Taylor sound hasn’t been your jam in the past, the Grand Pacific might change your mind. It’s definitely a guitar worth a test-drive. In 2018, Taylor introduced its patented V-Class bracing, a groundbreaking internal bracing system designed by master guitar designer Andy Powers. V-Class brought an evolution beyond X-bracing (which Powers felt had been pushed to its limits as a voicing framework), enabling Taylor to make fundamental improvements to the sound of an acoustic guitar—namely the ability to produce stronger projection, longer sustain, and more accurate intonation by putting the guitar top more in tune with the strings. More importantly, the flexible V-Class framework gave Taylor a powerful new platform for shaping an acoustic guitar’s tonal character in dramatic new ways. This fueled the creation of the Grand Pacific. Andy eliminated the low-end woofiness/muddiness often associated with dreadnought-style guitars. The Grand Pacific produces warm low-end power but with more clarity, which means the bass frequencies are more musical and less problematic for recording and other applications. Some traditional X-braced dreadnoughts create their low-end power at the expense of other frequencies. With the Grand Pacific, you’ll hear smooth, warm, powerful notes consistently across the entire frequency spectrum. The Grand Pacific also isn’t musically confined the way a dreadnought can be. It blends the power of a bluegrass guitar with the clarity and playing comfort that singer-songwriters and even fingerstyle players will enjoy. Its all-around utility makes it a fantastic workhorse guitar. Compound carve neck profile: Designed to complement the way a player’s hand position shifts as it moves up the neck, the profile subtly transitions from a slight V at the nut to a rounded C, with a rounded, ridgeless heel. Rolled fretboard edges: This is a subtle comfort feature that players will feel on both sides of the neck. New Curve Wing bridge shape: Rounded edges and other refined contouring update a signature Taylor aesthetic to make the bridge feel more comfortable against the pick hand. All Grand Pacific models (including the 317) also include a new deluxe hardshell guitar case featuring a luxurious exterior with a Western floral pattern that resembles tooled leather. Among the first generation of Taylor Grand Pacific guitars, the Builder’s Edition 517 dramatically expands Taylor’s sonic palette with a new flavor of acoustic tone that may surprise players who think they know the Taylor sound. An exciting new entry into the dreadnought category, this round-shoulder Grand Pacific resonates with a finely-honed balance of low-end power and clarity across the middle and upper registers, producing warm, rounded tone in which notes blend seamlessly together to create a seasoned sound. Back and sides of neo-tropical mahogany flavor the sound with dry, woody character, coupling beautifully with the dynamic response of the torrefied Sitka spruce top. The Builder’s Edition stamp means that the 517 is detailed with premium features designed to maximize player comfort, including chamfered body edges and a new compound-carve neck profile that compensates for the change in your hand position as you move along the neck. Subtly contoured fretboard edges and a rounded, ridgeless heel add to the guitar’s pleasing fretting-hand feel, while a refined bridge shape brings extra comfort to your pick hand. Under the hood, V-Class bracing enables the guitar to pump out stunning projection and sustain, plus nearly perfect intonation, which means you won’t have to contend with sour notes on the fretboard. Between its sound and feel, the Builder’s Edition 517 once again raises the bar on the Taylor playing experience. Model Options: The 517 is offered with either a natural or Wild Honey Burst top, and either with or without Taylor’s Expression System 2 electronics. Part of Taylor’s inaugural class of Grand Pacific guitars, the Builder’s Edition 717 builds on a long tradition of rosewood/spruce dreadnoughts, but breaks new ground with an entirely new Taylor sound. 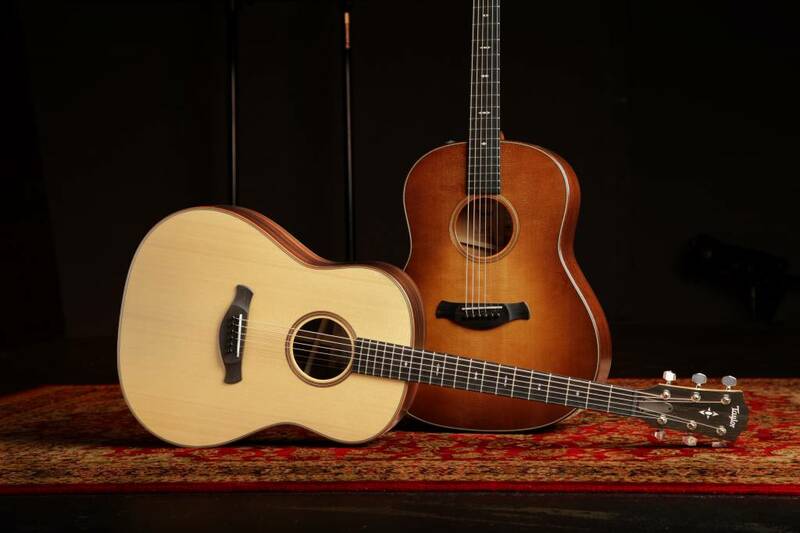 The round-shoulder dreadnought shape, featuring Taylor’s award-winning V-Class bracing, produces warm, seasoned acoustic tone in which individual notes overlap and blend smoothly together, while the low-end power common among dreadnoughts boasts greater clarity here. V-Class brings extra punch and sustain, along with improved intonation and musicality across the entire frequency spectrum. Together with rosewood’s harmonic complexity and the played-in sound of the torrefied spruce top, players can expect rich, luxurious tonal character from top to bottom. It’s a voice comfortably rooted in a traditional sound, yet updated to offer more expressive musical range. As a Builder’s Edition model, the 717 also sports an array of premium, player-friendly features: chamfered body edges, rolled fretboard edges, and a new compound-carve neck profile, whose contours match the natural adjustments in the player’s hand position when moving up and down the fretboard. Even the bridge design was refined to add a more ergonomic feel for the player’s pick hand. Taylor’s noise-reducing Silent Satin finish displays the muted sheen of an older guitar, while elegantly understated appointments include mother-of-pearl Arrowhead fretboard and peghead inlays, with sapele binding. It all adds up to a Taylor like you’ve never seen, heard or felt before. Model Options: The 717 is offered with either a natural or Wild Honey Burst top, and either with or without Taylor’s Expression System 2 electronics. The Grand Pacific 317, featuring Taylor’s new round-shoulder dreadnought body voiced with its award-winning V-Class bracing, helps usher in a whole new Taylor sound. Notes blend smoothly together to produce a warm and seasoned acoustic voice with clear low-end power. Built with solid sapele back and sides and a solid Sitka spruce top, the 317 boasts a tonal response that sits comfortably between the dry, focused character of mahogany and the harmonically complex sound of rosewood. The body’s wider waist helps produce a strong bass response, but without the woofiness that can sometimes plague bigger-body guitars. That low-end clarity blends evenly with the guitar’s mids and highs, yielding a rich, dynamic tone with notes that overlap into a seamless whole. Our V-Class bracing, tailored for the Grand Pacific body, dials up the power and sustain, along with improved intonation, making this a versatile tool for jamming with other musicians, playing alongside a vocalist, or embarking on solo adventures. This edition comes equipped with our onboard ES2 electronics, and thanks to the clarity of the low-end frequencies, the guitar will be less inclined to feed back in amplified settings, making it a reliable partner for plugged-in applications. Whatever your musical calling, the Grand Pacific 317 will make an inspiring companion. Model Options: The 317 is offered either with or without Taylor’s Expression System 2 electronics.